In a first little room two big panels introduce the exhibition rooms where the Geo-paleontological and archaeological sections are developed. The first panel, on the right wall, shows the birth and evolution of the museum and the silhouette of the self-taught scholar Vittorino Cazzetta, a native of Selva di Cadore. 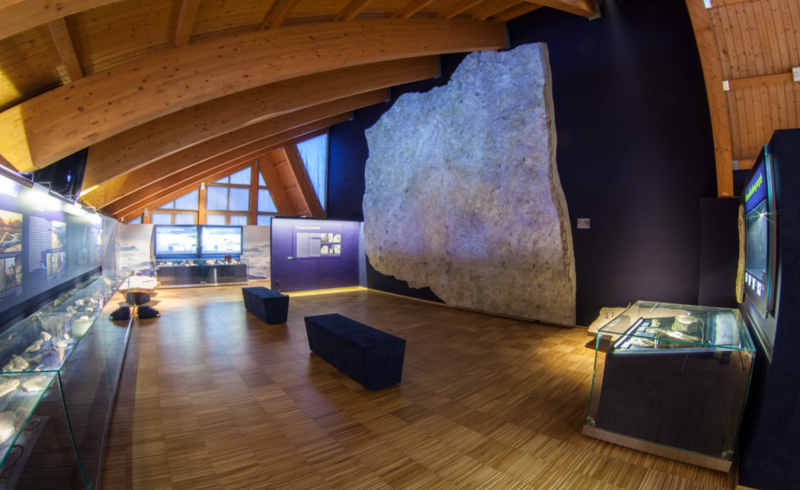 The second panel on the left wall, helps to locate the main geo-paleontological and archaeological findings displayed in the museum and traces a clear summary, starting from the prehistoric times of Val Fiorentina; a valley that has been identified of primary interest (core areas) by UNESCO, recognizing the Dolomites as World Heritage Site. 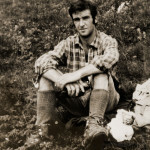 Taking the long corridor leading to the heart of the Geo-palaeontology section of the museum there is a giant photography of Vittorino Cazzetta, a passionate student of his territory. The museum has been named after him. The display panels that follow in this gallery give a first hint of the geology of the Dolomites, narrowing the area to the territory of the Val Fiorentina, with two digressions regarding local minerals. Two panels deal with them: one refers to the so-called “hollow onyx” (it was an underground quarry, very particular as a source and for the material extracted), the other concerned with the extraction of the mineral (siderite manganesifera) from the nearby mines of Fursil with its transport routes: the so-called “Road from the Vein” and the various “Iron Roads”. The former was used to transport the extracted mineral to the castle of Andraz, to the furnace Armentarola and from there to Bressanone. The latter to supply the various furnaces of the area, part of the Republic of Venice, that is, of Selva, Caprile, Pescul, Dont, Forno, Borca di Cadore. Continuing along there is a room where the visitor is guided through the entire geological history of the valley: illustrating panels, drawings, photographs, special and detailed reconstructions of ancient dinosaurs, rock samples and a remarkable collection of fossils, describing how the area has changed during the Triassic era. This geological period, between 251 and 199 million years ago, is by far the most extensively documented in the Dolomites. Above the room a huge cast was placed, reproducing the surface of a dolomian rock, collapsed at the foot of Mount Pelmetto, where footprints of various vertebrates can be seen. They were recognized, for the first time in Italy, as dinosaur footprints. These footprints represent the topical element of this section; a “holographic” projection on the cast also nicely shows their arrangement in a real dinosaur track.